Guess what! Write The Word Journals are back in stock over at Cultivate What Matters Shop! Yippee! I have written about how I use my Write the Word Journal with y’all in multiple posts, but I wanted to share how YOU can use yours! 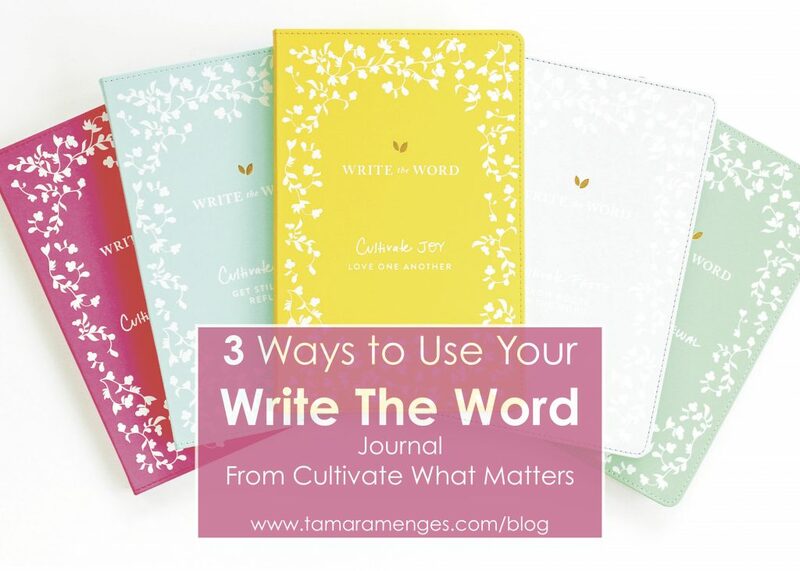 Quiet Time: If you are a veteran to quiet time or new to the concept, the Cultivate What Matters Write The Word Journal is the perfect way to spend just a few minutes a day with the Lord. Quiet time can either be first thing in the morning, during a break at work, during naptime, or before bed. All of these times during the day are opportunities to get quiet, pray for focus on what God wants to teach you from His Word, and then listen and write down what He is showing you. If you are perhaps a new Christian or just new to setting aside quiet time, this journal is the perfect transition because there are just a few scriptures (sentences) with each entry. You are just simply rewriting God’s Word. Do any of these times during your day happen often? I would love to hear how you dig into God’s Word! This post contains affiliate links friends! I receive a small commission if you make a purchase, but you are not charged in any way for it! All enthusiasm and opinions are my own, and I truly believe in Cultivate What Matters!